NEW YORK — Try running 100 marathons in 100 days over seven continents. Ultra-marathoner and water activist Mina Guli came close — all in an effort to raise awareness about global water shortages and how to prevent them. The 48-year-old Australian started at the New York City Marathon, posted daily updates on Twitter and completed 62 marathons in 62 days on five continents until she was diagnosed with a fractured upper thigh in Cape Town, South Africa. But that didn't stop her efforts to educate people about water. Thousands of supporters from 44 countries ran on her behalf, "donating" more than 19,000 miles for her cause, posting their mileage on Twitter and far surpassing her original goal of 2,620 miles. That's like "running from the North Pole to the South Pole and more," said Guli, in recent phone interview with The Associated Press. She ended the journey where it began, getting pushed in a recumbent wheelchair around Central Park. The ceremonial finish last month included scores of people running for her down Park Avenue to the Colgate office in midtown Manhattan. Aided by canes, she walked across the balloon-lined tape to the cheers of supporters. "We still have a lot of work to do because our planet is running dry," said Guli, noting experts estimate by 2030 the demand for water will be 40 percent greater than supply. The United Nations, which is celebrating World Water Day on Friday , defines water scarcity as a physical shortage or a lack of access and infrastructure. Those shortages are often caused by poor planning and management, which can result in shrunken lakes and coastal areas or the lead-contamination crisis in Flint, Michigan. A lack of clean water globally leads to disease and death, puts the burden of water collection mostly on women and children, interferes with education and contributes to poverty. "This is a movement for change. It's a bunch of people online, sharing information and facts," she said. "The ask is to push water to the top of the agenda to say we as a world have a water problem. And we need to act now." Guli ran through deserts, met fisherman in Uzbekistan near the shrinking Aral Sea and distributed gallons of water in South Africa. She met with researchers in the U.S. and witnessed innovations around the globe to stave off shortages. 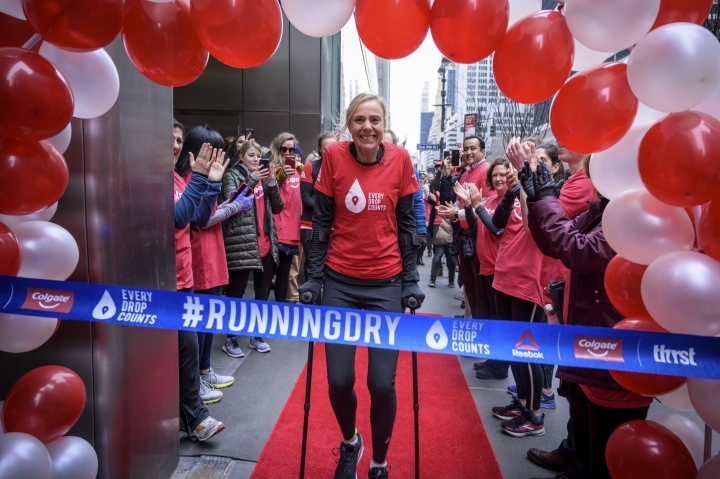 Here are more things to know about the (hashtag) RunningDry campaign and Guli, who grew up in Melbourne and appreciated the value of water during frequent droughts. Her Australian community would conserve and recycle — "turn off the taps, take short showers, capture every drop and put it on the garden." Guli earned a law degree and attended the World Economic Forum to learn more about water issues. She says agriculture uses the most water, about 70 percent, to raise livestock and other food. Manufacturing accounts for about 20 percent and the remaining 10 percent comes from home usage. Increased populations and industries put a strain on supply. In 2012, Guli founded Thirst.org, a nonprofit based in Hong Kong that teaches youth in China about sustainable water consumption. Her 26.2-mile treks took her through North America, Europe, Asia, Australia and Africa. A medical support team traveled with her, with some running or biking alongside during the grueling journey. A photographer and cinematographer captured the entire 100 days. The leg fracture stopped Guli from reaching South America and Antarctica, but she hopes to get there. She recommends simple, everyday lifestyle changes such as turning off the water while brushing teeth, using a water bottle and bringing a reusable cup to the coffee shop. "One coffee cup we use for 10 minutes took about 200 liters (52 gallons) of water to make," Guli says of the water for the tree and mixed plastic in the paper cup. "If everybody turned off the faucet (while brushing)... we would save over 50 billion gallons of water a year globally," Guli said of a study by Colgate, which sponsored her globe-trotting efforts along with Reebok. The journey took her to Beaufort West in South Africa, about 3 hours north of Cape Town. Guli and others hitched a ride to help the government distribute 1.3 gallon jugs of water to families where it "had literally turned the taps off" in a city run dry. "I cannot tell you what it is like to see children and teenagers run after this truck with water, begging for more water." She said arguments broke out in the street "when trucks turn left instead of right or right instead of left because people were expecting a delivery of water that day." It showed "the enormity of the scale of the water crisis right there in front of you." Guli recommends listening to scientists, who can predict rainfall patterns, and putting money behind policy changes. "The supply of water is affected by climate change, which is leading to changing weather patterns. Rain is falling where it didn't use to fall. There are more floods. The problem with floods, we don't capture the water and it doesn't actually replenish all the underground water supply," she said. Students around the world skipped school last Friday in a call to action on climate issues. Guli says it takes about 10 gallons of water to make a gallon of beer. She met Mike Mallozzi, president of Borderlands Brewing Company in Tucson, Arizona, who has reduced it to 4 gallons. Mallozzi, who has a Ph.D. in microbiology, conserves water, uses solar power and reuses grain for compost. "He's reconfigured his whole business to ensure he protects the environment," she said of more efficient methods to make the beer, clean the equipment, grow the hops and power the brewing cycle. After completing two 40-marathon challenges in the past, Guli admits 50 marathons would've been a better choice. But she's determined to press on. "This journey is not going to end here," she said. "This is an issue which faces all of us. Not just 50 years from now, but right now."